When innovation, quality, performance and competitive pricing are pre-requisites for your mission-critical documents, ROTASET is the number one supplier. The best business forms accomplish two tasks – reduce paperwork and administration for an organisation, while projecting a professional, modern image to it’s customers. Since 1947, ROTASET has provided vital paperwork systems to multi-national and blue-chip organisations, with an emphasis on the transactional, insurance and enforcement sectors. As business processes grow in complexity, our forms are refined and adapted. If the relevant options and features are integrated, security and efficiency can be increased, whilst maintaining a smooth workflow. 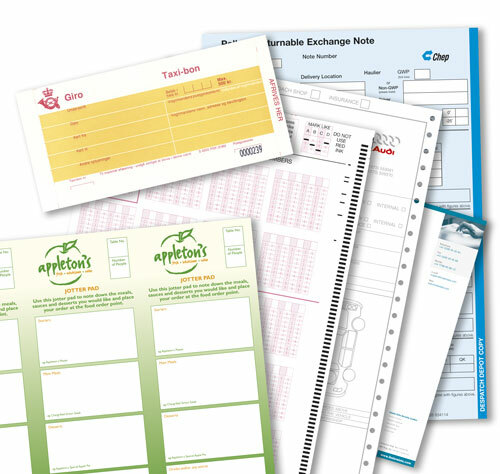 The broad product range available from our Lincolnshire-based factory incorporates: carbonless forms, sets, pads and books; register sets; continuous computer and laser stationery; OCR forms; mailers and other special products. All elements are manufactured in-house, ensuring timely delivery and tight controls on quality. From the simplest to the most complex requirements we can handle your needs.